Description: Ex Conrail unit is numbered haphazardly by CSX: 8774 is in the midst of their SD60M roster range. Westbound off the Trenton Line at VINE. Description: Westbound CSX freight Q409 by Vine under the B&O CPL signal mast behind ex Conrail pairing. Description: Ex Conrail pairing leads CSX freight Q409 west on one at Vine. Description: Ex Conrail units head west on 1 around the curve west of VINE with CSX freight Q409. Description: Just a few minutes after 2 Amtraks went through here, an eastbound stack train blasts by! I'm pretty sure the signal tower is CP 290. Title: Don't ever get old. Description: Camera was off for the first shot. Not sure about the SD60, whether it's an I or an M. maybe you can help. Thanks. Title: A trio of EMDs. Description: After a lot of checking and input from various sources, the 8774 will be listed as an SD60I. Conrail Historical Society confirms that CR 5544 was the first such unit for CR. All others that they got were in a different # sequence. That's what's caused some of this confusion. Thanks to all who tried to help. Description: These two units lead a long line of vehicular flats toward Gibson yard by sliding around the back side of the IHB roundhouse. Looks like 584 has seen some hear, maybe even a minor fire. Description: The two units even pass by several maintenance of way trucks parked near the IHB roundhouse as their train moves westward toward Gibson Yard. Description: Behind the pair leading the westbound vehicular flat train to Gibson Yard, you can see the back wall of the IHB roundhouse. Description: CSX Q235 waits in the siding for a meet with Amtrak P091. Description: CSX Q235 gets under way after meeting Amtrak P091. Description: CSXT 584 and 8774 lead the Tropicana Juice Train through the curves at Lansdowne. Description: Q158 comes through Dolton Junction on his way to Syracuse. I love the paint scheme on the CW60AC's. 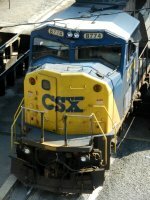 Description: CSX 691 leads a train east. Description: Engineer Trainee Chris Emry and Engineer Paul Volosyn are aboard.